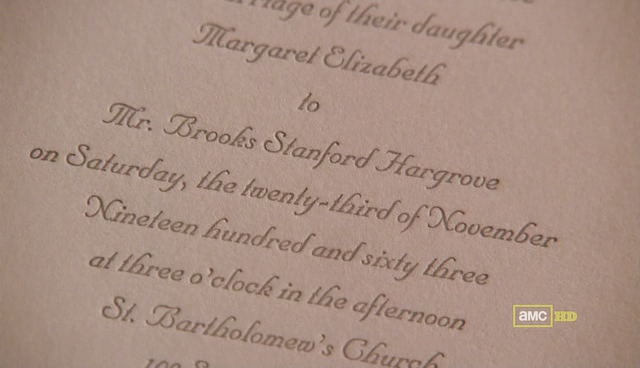 When Roger Sterling’s daughter, Margaret, needed wedding invitations in 1963, they called me – in 2009. I know it seems crazy but…..
OK. I will admit that the prop master, Gay Parello (who by the way is totally cool and very on top of the look, as you would have to be to work on a demanding period show like Mad Men) came to Tiny Pine Press because she needed to have a type of printing that was authentic to the period (letterpress) in a type that was of the period (Nuptial Script). AND they needed it FAST. I think I turned this project around in 3 days. I was more than pleased to help out one of my very favorite television shows! In the episode they talk about bells, and silver, and maybe blue – I can’t remember – but at the end of the day they didn’t show anything but the type. You will have to take my word for it that the invitations actually did have bells and silver and there were three different versions of them. But I will take the airtime, with or without those silly bells! This entry was posted in art, invitations, printing, wedding invitations and tagged Letterpress, Los Angeles, Mad Men, printing, vintage, wedding invitations on September 22, 2009 by tinypine. I invited a friend over for morning tea today. I got up and drank some pre-tea to get enough caffeine to un-morningize enough to bake scones for us. I LOVE scones. But not always. I remember tasting them at a coffee shop and be confused about why someone would want to eat dry crumbly flour with their hot beverage. My momma used to bake biscuits all the time. Biscuits are just the yummiest at all times of the day, with jelly or tomatoes or just by themselves with butter. (ohhh butter biscuits) and once I figured out that scones were just sweet biscuits, well, I found my new favorite treat. I can bake a batch and have them all week for breakfast or toss them around to friends and then everyone is smiling. Which is a goal. Smiles via baked goods are so sincere. So, say you got up this morning with the intention of baking some blueberry scones for your friend who thinks of you as a really great “bakestress” already. and then you are sort of tired because usually you drink coffee instead of tea and maybe you are used to MORE caffeine than that. and you get distracted doing the substitution for double acting baking powder, that you FORGET to put in the baking soda. all together. 1/2 tablespoon baking soda missing totally from the recipe. hmmmm. this happens 15 minutes before the friend is due. the friend that thinks you bake so well… too late to make a new batch. the blueberries are in short supply. there are some clementines? what to do? what to do????? you cross your fingers and hope hope hope that because you remembered the baking powder….. maybe that will be enough to rise them a little. OR you will get blueberry biscotti rounds….. Guess what. in the end, these were delicious and they aren’t perfect. a little life lesson on a lovely morning. This entry was posted in art, baking, family, Uncategorized and tagged scones on September 6, 2009 by tinypine.